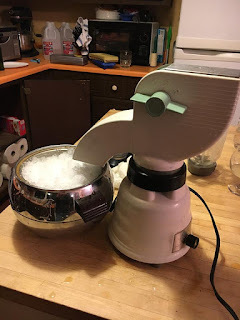 Sunday evening and hubby is using everything - including the kitchen sink - to make Margaritas! *grin* He dug out the old oster blender and ice crusher and is having a fun time mixing our drinks. Best he's made yet...Well this time! 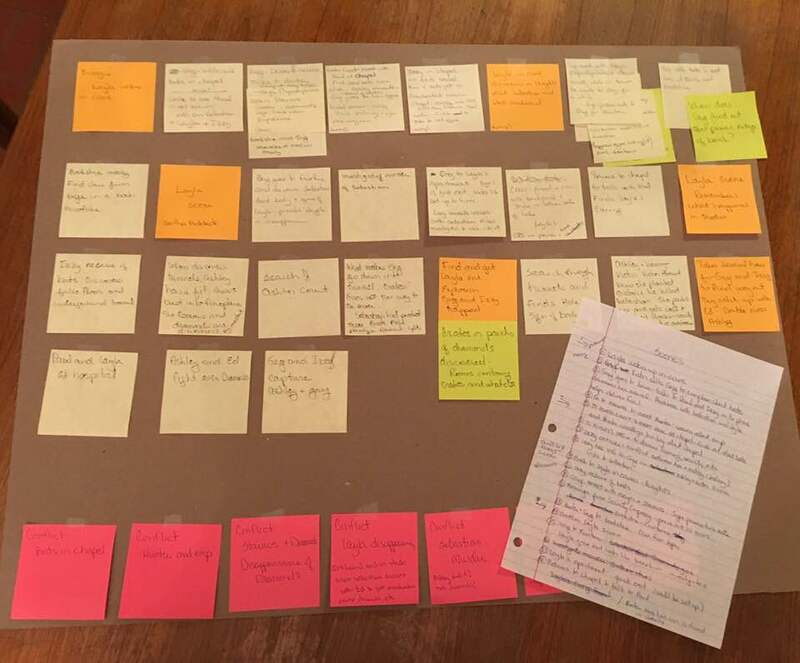 I made great progress this week with outlining my current WIP on poster board and had more than a few epiphanies! I've always been a visual person so don't know why I didn't try this before. Love seeing each scene and how I can move each one around to make better sense. 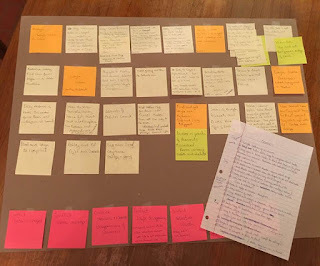 I'm far from done and have written more notes, found holes in the main arc and subplots and discovered which characters I need to still interview. Even after two sessions with the storyboard, I can see I need to put in more time ironing out details so this week will continue to work with the story board and adding scenes. I have made a lot of changes regarding the number of characters, deleting some and including new ones, plus I had too many points of view. I also forgot I had just the basics on my villains and never interviewed them, so will work on their background as well. I think I'll give myself two more weeks for refreshing myself on story points, discovery and interview process, with the goal of beginning actual rewrites the first week of February. I know characters will reveal new information and some things will change as we move through the story, so as always I'll remain flexible. However, life interrupts with taxes so I'll be working on those this week. I need to run our 2017 numbers and find out if we own more in taxes than originally planned for, since our next estimated payment is due. I know I should have done this a while back, but just didn't have the time. Plus we coming to the end of the 1st semester of 12 grade and you guessed it, grades are due. Lots of numbers will be floating through my head for the next few days. Meanwhile I'm 2/3rd's of the way through Sharon Kay Penman's historical novel, The Sunne in Splendor. I really enjoy her writing. I shelved The Courage to Write because it was too negative for me and happily reading Natalie Goldberg's Writing Down the Bones essays as well as Write a Novel in Ten Minutes a Day by Katharine Grubb. I've been quite inspired the past couple weeks and feeling more creative. I now look forward to writing, embracing whatever emotion is raised in the moment rather than burying my head in a book and ignoring life. Loved "Writing Down the Bones", but I'm really interested in "Write a Novel in Ten Minutes a Day"! This week, my 52/52 book is "The Eight Minute Organizer", so this sounds like it would fit in perfectly to my current mindset. ;) So what was so negative about "The Courage to Write"? After reading Fierce on the Page and Fire Up Your Writing Brain, I think I was expecting something more inspirational and it simply wasn't.